Vineyard Hotel is a hotel group uniting three independent hotels in Cape Town: The Vineyard, Townhouse Hotel and Oude Werf Hotel. They joined efforts with Triptease in late April 2018 to improve their website guest experience and drive more direct bookings. As advocates for innovation in the hospitality industry, the Vineyard Hotels team understands the importance of a seamless digital experience to drive direct business. Hotel business in South Africa can be old-fashioned, admits Justin Exner, Group Digital Manager at Vineyard Hotel/Townhouse Hotel/Oude Werf Hotel. Hotels often fall behind their peers elsewhere in the travel sector when it comes to technology. As a result, OTAs dominate bookings for hotels in Cape Town. For an independent group like Vineyard, the main challenge is to compete with industry giants such as Booking.com and Expedia for online bookings. 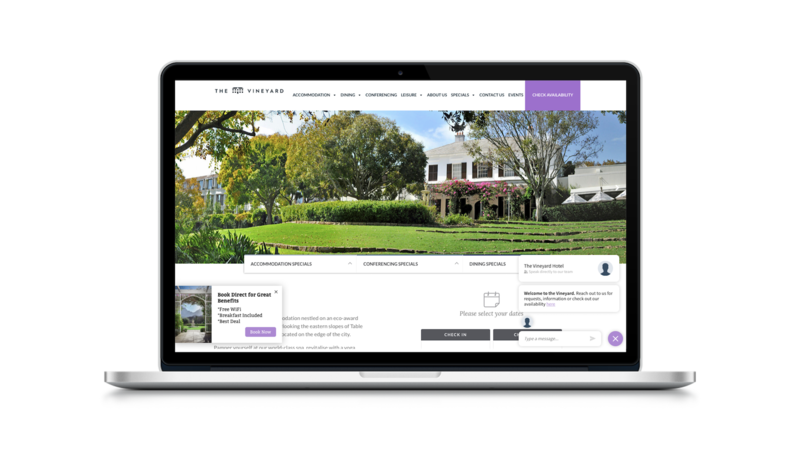 The only way for Vineyard Hotels to own their relationships with guests was to enhance their online guest experience by embracing the innovation taking place in the hospitality industry. For the Vineyard team, it was important that any software they used was customizable, tailored to the hotel’s needs and cohesive across all group functions. They found all that and much more in the Triptease Platform. The technology-savvy hotel team has truly embraced Triptease’s AutoAgent: in only thirty days, the bot had 366 conversations with website guests, 14 of which resulted in bookings. Triptease’s engineers have designed the first and only automated chatbot built with hotels’ needs in mind. It answers property and booking related questions more precisely than any other chatbot currently available on the market. It is also a helping hand for hotel staff, aimed to significantly reduce workload while improving the customer experience. Thanks to AutoAgent’s unique ability to both check availability and quickly answer specific questions about the hotel, it was able to provide quality responses to guests’ questions 71% of the time. In the 29% of cases where AutoAgent couldn’t answer a user’s enquiry, an email capture was triggered. In this case, 37% of potential guests proceeded with an email enquiry to be picked up by the team. Vineyard Hotels has also embraced sending targeted messages with Message Porter to highlight the benefits offered by the hotels when guests book direct. They also consistently keep track of any disparities rates in Disparity Dungeon to make sure the best room prices are displayed directly on their website. Guest interaction with AutoAgent has proven to be a significant factor in driving bookings. Over three months of conversing with website guests, AutoAgent contributed to a 3.99% conversion rate following guest interactions as opposed to 0.71% conversion rate for those who didn’t start a chat. The Nudge Messages built with Message Porter resulted in a conversion rate of 7.06%, earning the properties $52k (42:1 ROI) in revenue from May to August 2018. Integrating with the Triptease Platform resulted in an impressive 12.5 % decrease in undercut rate as the team reduced their disparities easily with Disparity Dungeon. Triptease innovates continuously, and so do Vineyard Hotels. They intend to stay up to date with new technologies, training AutoAgent to score an even better quality response rate. Justin revealed to us that the next step is improving their mobile guest experience. The platform is here to help him achieve it: our team has developed all features with responsive websites in mind. Don’t forget that Triptease’s Direct Booking Coaches are just a phone call away and can help you use all areas of the platform to create the right digital experience for your hotel.